The UW-Platteville men’s basketball team knocked off UW-Stevens Point 70-57 Saturday night to win the WIAC Men’s Basketball tournament title for the second time in program history. The victory earns the Pioneers an automatic NCAA tournament bid. It’s the first WIAC tournament title for the Pioneers since 1999. That year (1998-99), the Pioneers beat UW-Stout 90-88 in the title game and went on to secure the program’s fourth national title. The Pointers took a 55-54 lead on a Drew Fredrickson 3-pointer with 4:25 left to play. That’s when Platteville senior Robert Duax responded by scoring nine unanswered points to give the Pioneers a 63-55 lead. Platteville finished the game on a 16-2 run to seal the victory. Duax had 20 points to lead the Pioneers. Senior Clay Gerds scored 16 points going 6 of 6 from the field, 2 of 2 from 3-point range and 2 of 2 from the free throw line.Junior Ethan Bublitz had a team high 15 points for the Pointers. The Pioneers will find out who they’ll face in the opening round of the NCAA Tournament with the NCAA Selection Show on Monday morning. Third-ranked UW-Oshkosh clinched at least a share of its first WIAC men’s basketball title in 17 years, knocking off UW-Platteville 83-81 in overtime on Wednesday. The Pioneers Carter Voelker recorded a steal and drained a three-pointer to force overtime, tied at 73. They led by as many as six points in the overtime before Oshkosh came back to win. 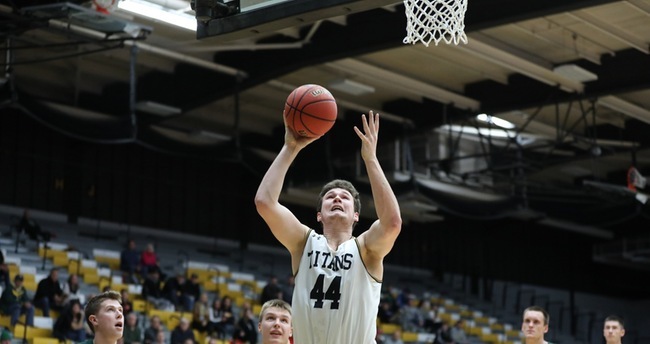 Jack Flynn scored a career-high 28 points and matched his career best with 15 rebounds to lead 4th ranked UW-Oshkosh to a 85-63 win over UW-Eau Claire on Wednesday night at the Kolf Sports Center in Oshkosh. The Titans’ (17-1, 7-0 WIAC) 17 wins in their first 18 games marks the best start in the program’s 121-year history. Oshkosh also extended its school-record winning streak to 16 games, the 11th longest in WIAC history. They also improved to 7-0 in league play for the first time since winning a program-best nine in a row to start the 1967-68 conference season. For the 12th straight season, the Wisconsin Intercollegiate Athletic Conference (WIAC) will be represented by multiple teams in the NCAA Division III Baseball Championship after University of Wisconsin-Oshkosh and UW-Whitewater received bids into this year’s championship. The teams earned two of the 18 at-large spots into the 58-team field. UW-Oshkosh (31-8) will compete in a regional hosted by College of St. Scholastica in Duluth, Minnesota. 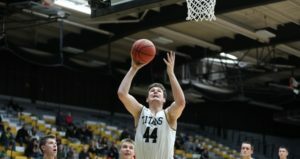 The Titans, who are making their league-leading 25th NCAA appearance, and first since 2008, will open against Bethel University (Minn.) (32-9). Oshkosh won national titles in 1985 and 1994. UW-Whitewater (31-6) is making its 11th straight appearance and 21st overall with national championships in 2005 and 2014. The Warhawks will participate in a regional hosted by the St. Louis Intercollegiate Athletic Conference in Sauget, Illinois. The Warhawks will face Monmouth College (Illinois) (28-12-2) in their first game. Both regionals follow a double-elimination format and begin on May 17. Winners of the eight regional tournaments will qualify for the NCAA D-3 Championship at Fox Cities Stadium in Appleton, May 25-30. The 2018 Championships mark the final season that the event will be held at Fox Cities Stadium. The NCAA Division 3 men’s basketball tournament has strong representation in the Sweet 16. Three teams remain, including Platteville, which will host a four-team sectional on Friday and Saturday nights. The Pioneers (24-4) will host Nebraska Wesleyan (26-3) (7:30 p.m.) in the second of two games, while fellow WIAC member Stevens Point (21-8) will meet top-ranked Whitman (28-1). The Pointers captured the WIAC Conference tournament. Oshkosh (22-7) will face Emory (23-4) of Atlanta in a sectional semifinal in Rock Island, Illinois. Friday night winners will advance to the finals on Saturday for the right to play in the NCAA Final Four. The Pioneers are in the Sweet 16 for the first time since 1999 after finishing last in the WIAC (1-13) a year ago. 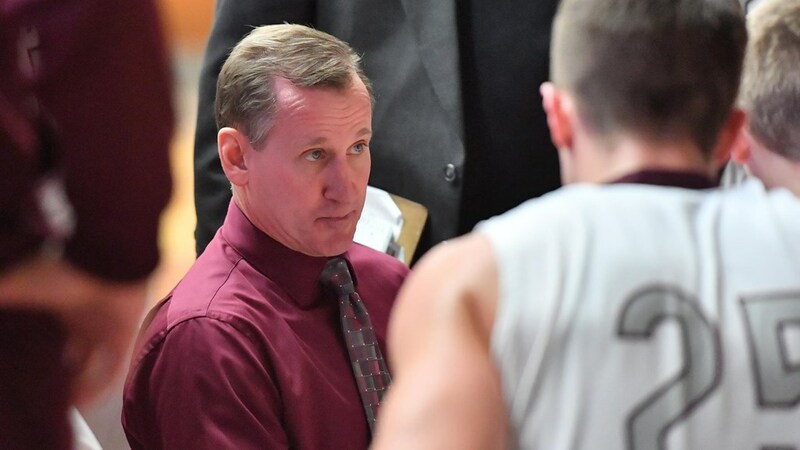 UW-La Crosse head men’s basketball coach Ken Koelbl has resigned to pursue a full-time position in the University’s Admissions Office. Koelbl just completed his 14th season as the Eagles’ head coach in 2016-17. The University will hire an interim coach for the upcoming 2017-18 season and conduct a national search for a full-time replacement at the end of the upcoming season. 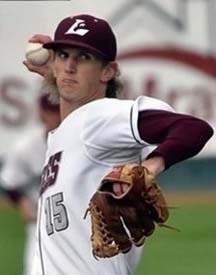 Koelbl led UW-La Crosse to nine overall winning seasons in the last 12 years. The Eagles advanced to the Wisconsin Intercollegiate Athletic Conference (WIAC) Tournament Semifinals six times (2006, 2007, 2012, 2014, 2-16, 2017) under Koelbl, including three of the last four seasons. Koelbl was named the 2015-16 WIAC Coach of the Year after leading UW-La Crosse to its 12th regular-season conference title in school history and first since 1965. The Eagles finished 16-10 overall and 10-4 in the WIAC in 2015-16. Koelbl compiled an overall record of 201-161 (.555) and 105-113 (.482) in the WIAC at UW-La Crosse. He ranks second in school history in victories (201). Burt McDonald is the all-time leader (263). 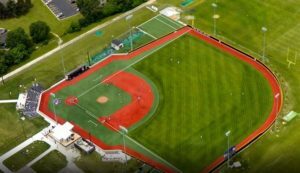 Second ranked UW-Whitewater will host the Midwest Regional of the 2017 NCAA Division III Baseball Championship starting Thursday at Prucha Field at James B. Miller Stadium. The Warhawks (35-7 overall) are the number-one seed in the eight-team regional and will host eighth-seeded St. Norbert College on Thursday at 1:15 p.m. The Green Knights won three straight elimination games on Saturday to win the Midwest Conference Tournament. 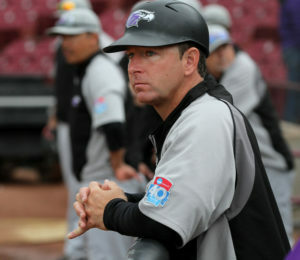 One day after clinching the WIAC regular season baseball title, UW-Whitewater coach John Vodenlich earned his 500th victory at the school in a 23-6 win over UW-Oshkosh. The Warhawks went on to sweep the double-header, then win two more games at St. Norbert College on Sunday to finish the regular season with a 32-6 record, 17-3 in league play. It also gives Vodenlich 503 career wins at Whitewater and 532 wins overall, counting his two year stint as head coach at Edgewood College. Vodenlich, who is in his 14th season at the school, is the fourth coach in WIAC history to reach the 500 win milestone. Whitewater will host the four-team WIAC Tournament this Friday and Saturday. The top-seeded Warhawks will host Oshkosh in the second game of the tournament at 1 p.m. Friday afternoon. Third-seeded Stevens Point faces 2nd-seeded La Crosse in the opener at 10 a.m. on Friday morning. The WIAC Tournament champion will receive an automatic bid into the NCAA D-3 Tournament at Fox Cities Stadium.